Plaster Rock, NB (March 27, 2014) – An infrastructure investment of $2.5 million is being made by Twin Rivers Paper Company Inc. in its Plaster Rock mill. A third production shift will be added and 50 new employees will be hired. 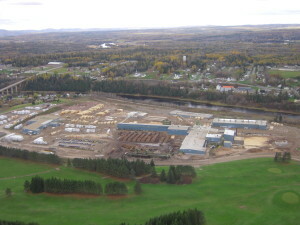 Forestry is the largest employer in New Brunswick. The forest strategy was developed to provide a plan for the forestry sector to be more sustainable and competitive. The introduction of the new strategy and access to a sustainable wood supply will result in 230 employees at the Twin Rivers Plaster Rock operations, up from 180 employees. The 50 new jobs are to be in place by May 2014; and the new investment is anticipated to result in about 70 to 80 indirect jobs including in the woods and transport industry. Twin Rivers has been a vital economic engine for the region for over 80 years, producing specialty papers and lumber for multi-markets.